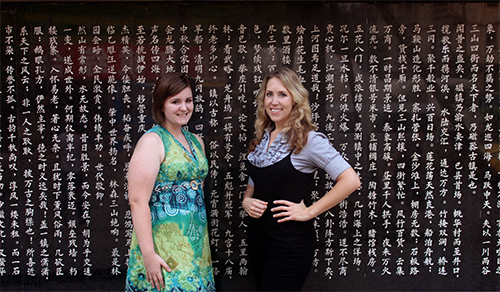 Photo Caption: WKU students Sara Moody (left) and Alyssa Surina (right) are in China this summer on the Chinese Summer Language Intensive Practicum. WKU students Sara Moody and Alyssa Surina are the recipients of scholarships from the Foundation for Asia Pacific Education. Moody and Surina are currently in China on the Chinese Summer Language Intensive Practicum, offered by WKU’s Chinese Flagship Program and led by Flagship Program Academic Director Liping Chen. Moody received a $1,000 scholarship from the Foundation and Surina’s scholarship was $500. Alyssa Surina is a senior who is double majoring in economics and math. She is from Nashville, Tenn., and plans to attend graduate school to pursue a doctorate in international economics. She is also the recipient of a summer 2010 Benjamin A. Gilman International Scholarship. Surina has returned to college to pursue a bachelor’s degree more than 10 years after receiving her associate’s degree. Surina initially thought that a study abroad experience would be financially and logistically impossible, but the intensive summer program offered by WKU’s Chinese Flagship Program, along with the funding opportunities she learned about from the WKU Study Abroad Office and the Office of Scholar Development, have allowed her to incorporate language study and cultural immersion into her schedule. When she returns to Bowling Green in the fall, Surina will continue her Chinese language studies as part of the Flagship Program. Moody and Surina are spending eight weeks in southwestern China on the Chinese Flagship’s Chinese Summer Intensive Language Practicum. The program is for beginning and intermediate level Chinese language students, and is based at Sichuan International Studies University (SISU) in Chongqing, China. SISU is WKU’s Chinese partner university for its Confucius Institute. One of the features of the Chinese Summer Language Intensive Practicum is the opportunity to engage with the community. As a group, the students are hosting “English corners” on campus every week, where Chinese students can come and have an opportunity for conversation in English. The Chinese Summer Intensive Language Practicum runs through July 29. About the Foundation for Asia Pacific Education: The Foundation for Asia Pacific Education is a non-profit organization dedicated to helping create global citizens and leaders, with a particular focus on supporting international experiences within the Asia Pacific region. About the Chinese Flagship Program: WKU’s federally funded Chinese Flagship program is designed to bring talented students who start with no knowledge of Chinese up to Superior levels of proficiency by the time they graduate from college. WKU is one of nine universities funded for Chinese by The Language Flagship through the National Security Education Program. About the Office of Scholar Development: The Office of Scholar Development is committed to helping students on all campuses and in all majors and degree programs develop the vision, experience and skills to be independent, engaged scholars. Students interested in investigating undergraduate scholarships such as the National Department of Defense SMART scholarships, or postgraduate funding opportunities, including the Fulbright or Rotary International Scholarships, should call to schedule an appointment with the Office of Scholar Development at (270) 745-5043. Contact: Scholar Development, (270) 745-5043.